MAA Vatsalya Card Yojana-Ma Vatsalya Card Yojana Gujarat Hospital List- Aplication give you all information and details related to government Yojana or Scheme in india. This application contain all information of new Maa Vatsalya yojana which launched by Modi government. Also contain more apps of Narendra Modi and news updates. This application provide all details about scheme which are declared by Narendra Modi (NAMO). For people who are living below poverty line & lower income group, an illness not only represents a permanent threat to their income and earning capacity, but in many cases it results in the family falling into a trap of debt. Ma Vatsalya Card Yojana Gujarat Hospital List Useful This Yojana.When need to get treatment arises for a poor family they often ignore it because of lack of resources, fearing loss of wages, or they wait till the last moment when it is too late. Health and poverty are interwoven. These families are pushed into a vicious debt poverty cycle due to excessive expenditures arising out of catastrophic health shocks. To address this key vulnerability faced by the BPL population in the Gujarat, Mukhyamantri Amrutam "MA" Yojana was launched on 4th September, 2012 by Government of Gujarat. Mukhyamantri Amrutam "MA" & "MA Vatsalya" Yojana provides tertiary care treatment to Below Poverty Line (BPL) population &to the families having an annual income Rs. 1.20 lakh or below Rs. 1.20 lakh per annum. There is no Insurance and hence there is no scope for any intermediary to make profits under "MA". Features. Fully Design for Offline Mode- Mose Inovative and User Friendly Designed. Totally free Download from Play Store Market. 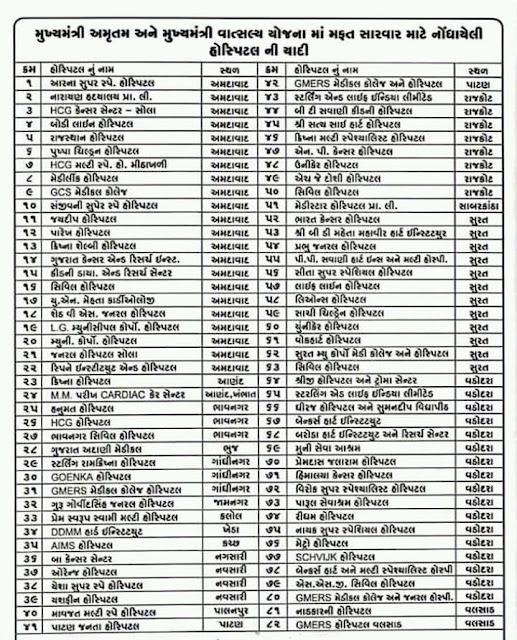 YouTube videos and podcasts on topics of full description about yojna.Ma Vatsalya Card Yojana Gujarat Hospital List Below Given.